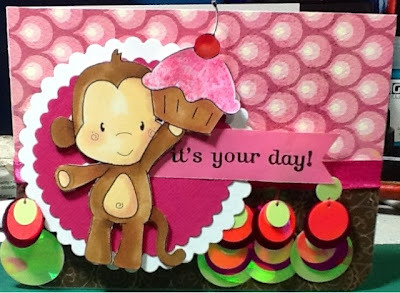 This little monkey comes from C.C.Designs- All That Scraps. Christine makes the cutest creations! He is offering the recipient a delicious cupcake...lets face it cupcakes are good anytime! I used My Minds Eye background paper. Plain Cardstock that were cut with spell binders. The ribbon trim is unknown as it was in the lamp making section at a discount store. The brown trim paper comes from Belva blvd. The monkey was coloured with copics. The monkey was coloured with E's and the cupcake bottom was too. I used dark reds for the cherry and light pink for the cupcake top. I put stickles, glam pink on the frosting. I used star on black to stamp the Stampin up sentiment on washi tape from Heidi swap. 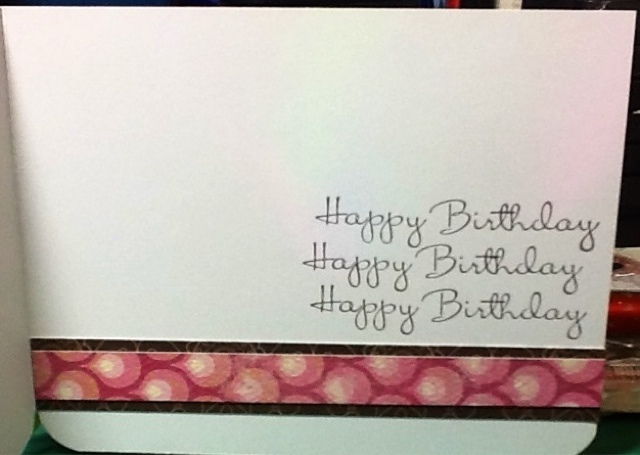 Inside the card I stamped a Stampin up happy birthday sentiment. And used some more My Minds Eye and Belva blvd. as usual I had a great time creating a sweet monkey birthday card!